I just recently finished reading Tim Riley's book of song-by-song analysis called Tell Me Why (which I recommend with a few reservations), and he says of "Come Together " that John wrote the lyrics about himself. But for as long as I've known this song, I've always thought each of the four verses was a mini-profile of each of the four Beatles. Thus, in the first verse, the "holy roller" line is an allusion to George and his interests in Eastern religion. The second verse is a bit more cryptic, but the third verse's references to an "Ono sideboard" and "Walrus gumboot" are clearly references to John, and the fourth verse's line, "got to be good-looking, cuz he's so hard to see," are pointers to Paul (always the "cute Beatle", right?) - which by default makes the second verse about Ringo. Personally I think reading anything into it is a waste of time - Lennon was clearly fooling around, and there's no deep meaning to any of it. It's enormously fanciful to think he put coded messages about each of the Beatles into the verses, but I suppose if you look hard enough you can find any interpretation you want. In Rock Band there's a studio outtake that sometimes plays before the song begins, and Lennon can be heard singing "He got... teenage lyrics". That's probably the most accurate interpretation of all. Now, tell me about Tim Riley's book. What are your reservations? Riley's book was a lot of fun for me, because I'm a musician and his analysis of each song is written from a "musicologist" point of view. He does some very thoughtful interpretation of their songs by noticing chord progressions, shifts in rhythm, use of counterpoint, things like that. I think his "read" of Revolver absolutely nails it, and he makes a very good argument for that album being their best - even better than Pepper. Reservations? He makes a few factual mistakes here and there, which were distracting to me and, I thought, damaged his credibility just slightly. For example, he makes passing reference to John coming in to add harmony on the third verse of "All My Loving " (it was actually Paul, double-tracking with himself); once in a while he gets a lyric wrong; things like that. And his own personal like or dislike of a song sometimes rises too much to the surface for my tastes. If he likes a particular song, he'll spend several paragraphs dissecting it and explaining it; but for songs that I thought deserved some thorough musical analysis (like "Within You, Without You"), he only dedicates one or two paragraphs before dismissing the song as unimportant. I'll probably never forgive him for shrugging off both "I Will " and "Blackbird " as basically forgettable songs. But on the whole, it's a book worth reading if you're a musician. Even if you're not a musician, it's still worth reading for the way he analyses not only the individual songs, but the overall shape and meaning of the albums as a whole (he is somewhat harsh, and rightly so, on the way many of the US albums tampered with the track order and inadvertently changed the impact and trajectory of those albums by doing so). Ooh, that sounds interesting - thanks. It sounds like it's pitched somewhere between Revolution In The Head and Walter Everett's books, which is just about my level. I'll add it to my list. of it." He wrote it for Timothy Leary's campaign, it was originally about coming together in a political sense... the rest is just pure Lennon wordplay with possible references to actual people. Obviously, "Ono sideboard" (and "walrus gumboots") is about himself and John has said that "bag productions" refers to his bag events (Vienna, etc.). I had read the Riley interpretation before. Seems to fit, but don't think it's that literal. When did he set up Bag Productions? I don't think it's a real production company, although he did use it on his letter to the Queen when he returned his MBE. He and Ono hid in a bag during an interview, that's where the name comes from. Eating chocolate cake in a bag"
There's even a Wikipedia article on Bagism. Ok. Joe's article seemed to imply that it was an official company of some type. But I suppose a letterhead isn't enough, is it? iCaramba - Ha, I thought he was against ~isms. It was never an officially-registered company, but in June 1969 Lennon and Ono set themselves up in a ground floor office of Apple on Savile Row and organised or did their interviews, peace campaigns etc there. Bag Productions was the name they gave themselves. I suppose they did it because it wasn't Apple business and it certainly wasn't The Beatles' either, so the name gave their activities a separate identity. Likewise, the Plastic Ono Band was initially only a conceptual thing; I think it was some kind of tape recorder/speaker thing set up on stands, which would mean they didn't have to attend concerts in person. It was only with the Toronto gig that it became a proper band. played it in the end. Does anyone know who acrually played it? Did Paul sang harmony vocals: Some say he didn't but it sounds more that he just didn't sing on the choruses. Wikipedia says that you can hear on the multitracks, discovered with the rock band game, that paul did. Does onyone know something about that multi-track thing? Many people say that john added a rythm guitar later but on the anthology take george plays a rythm guitar but no solo. The beatlesbible says that lead guitar was added on 30th july, was that the solo, if yes, who played it? Are there two kead guitars? Is there anyone who knows something about the guitars on come together? Joe has Paul playing the electric piano, and as well as Paul doing the backing vocals. I never thought of it as that way, I don't know how "he shoots coca-cola" describes even one of them. I ever thought of it as that way, I don't know how "he shoots coca-cola" describes even one of them. Good point...it probably made sense to John's drug-addled mind, or its a Beatle in-joke. Or its just a red herring. I'm not sure about how the verses all apply to individual Beatles- "He one holy roller," is about George, and that's in the first verse. I think that if its about the other Beatles, all the details are jumbled up, not in a strict Verse 1=Ringo, Verse 2=George Verse 3=Paul etc structure. Who has an armchair? Anyway I think it's a possible explanation for the "Yoko" part. HE COME GROOVIN' UP SLOWLY. GOT TO BE A JOKER HE JUST DO WHAT HE PLEASE." This verse references Ringo. "Flat-Top" makes reference to Ringo's bluesy musical roots and the disparaging stereotype that was often applied to those that played that style of music. "Groovin' up slowly" refers to the fact that Ringo was the last to join the final and 'official' line-up of the band, yet his drumming ability was very limited and borderline acceptable at the beginning, especially compared to the abilities of the rest of the band. As he honed his skill, he slowly became better and better at holding down the beat of the music, or 'groove' as it was also loosely referred to. As the group continued to record and release music, his talent slowly came up to the standards of the other three. "He got hair down to his knee" simply refers to the fact that Ringo had a longer, shaggy hairstyle when he joined the band, while the other three had the short, close-cropped style favored by the 'mods' of the day. 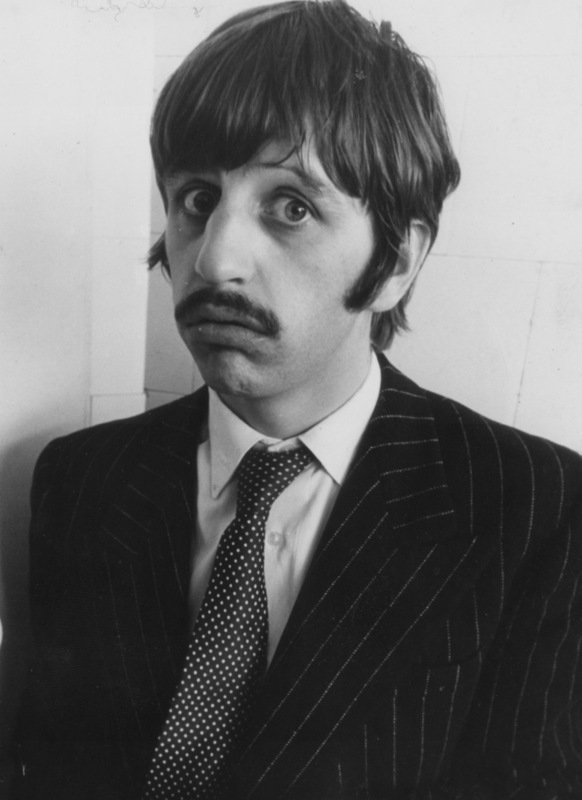 "Got to be a joker he just do what he please" is obvious: Ringo was the funny one, the 'cut-up' of the group and he often said and did bizzarre and unexpected things in formal situations the group found themselves in during the early years. His enthusiastic, upbeat attitude was a major influence of the early writings of John and Paul. The subject of this verse is George. "He wear no shoe-shine" is a reference to going to bare-foot, a quite-common state of dress that George adopted once he became so enamored of the Indian Maharishi Mahesh Yogi. Bare feet and simple robes were the accepted dress of the followers of the Yogi, and George's influence quickly spread to the other three Beatles. Toe-Jam football is just a reference to bare-foot 'soccer' style football playing, the common social outdoor activity practiced by many while worshipping at the yogi's temple. "Monkey-Finger" refers to George's manual dexterity and amazing abilty to master many, many different styles of stringed intruments, notably the 'sitar', an almost unknown instrument at the time that he was introduced to and quickly learned how to play while worshipping at the yogi's temple. "He shoot coca-cola" is obvious: 'coca-cola' is street-slang for cocaine, a drug that George, as well as the others, would often 'shoot up' directly into thier veins. "I know you, you know me...we got to be free" is simply the basic premise of the entire teachings of the Yogi, that George was so whole-heartadly promoting to his fellow bandmates. "COME TOGETHER RIGHT NOW...OVER ME" refers to the message the Yogi deleivered to the band asa group that would supposedly heal the growing rift and dissention between the four members of the band and unite them as a single cohesive unit once again. "Bad production" refers to John's increasing level of drug use and the negative effect it had on his abilty to effectivly create acceptable music with the rest of the band, and to function with the rest of the band. A 'sideboard' is the term used when attorneys would be called away from a trial during court for private discussion. "Ono sideboard" makes refernce to the growing distraction that the rest of the band felt Yoko Ono was having on John. John's increasing uncooperative attitude towards the professional and musical direction the rest of the band wanted to follow manifested itself in John constantly griping and complaining to the others, or in slang terms "breaking thier backs", a term referenced with 'spinal cracker'. "Feet down below his knee" also makes refernce to his stubborn, uncompromising desire to do things his way only with little or no regard for the rest of the band's wishes. To give in was to be seen as being on 'your knees', but John had 'feet below his knees', so there was no way he was going to kneel(stand on his knees) and be subserviant when he could 'stand on his feet' and be the decison-maker. "Hold you in his armchair (possibly..."arms, yeah...) you can feel his disease" refers to the fact that John's tough exterior persona barely fooled anyone, as his self-loathing and self-doubt, fueled and magnified by increasingly excessive drug use began to consume him. To be close to , or to 'hold him in your arm...' was to know the real John, where one could 'feel his disease'. GOT TO BE GOOD LOOKING 'CAUSE HE'S SO HARD TO SEE"
Well, last of the four is Paul, and this is clearly all about Paul. 'Roller coaster' refers to Paul's aggravating habit to the rest of the band by constantly changing his stated desire to either break up and move on to a solo career or to remain as a band and contue on as the 'Beatles'. 'Early warning' makes reference to the fact that they all made it clear to Paul long before that his selfish, superior attitide was going to create a rift between them and in fact it finally did. 'Muddy water' describes the bad feelings and growing poor relationship between Paul and the rest of the band due to his constant lying and manipulation of them, and particularly about his attempts to convince the others to let his father-in-law manage the band as opposed to the choice the others made. 'Mojo filter' refers to Paul's habit of 'spin doctoring' information to the others and manipulating thier perceptions so as to ultimately get his way. 'One and one and one is three' refers to Paul's attempts to try and convince the others that if he did indeed leave the band and start a solo career, they remaining three could carry on and continue to be 'the Beatles' without him, contray to everyone else's opinion. 'Got to be good looking...': a straightforward reference to the fact that he was typically considered the 'cute, good looking one' of the group. Does that explain it a little more? Im not sure if you are being serious but its certainly inventive. Bag Production was a?reference to Bagism and the like which went along the lines of if folks where in a bag then colour of skin, race, hair colour etc would be irrelevent as you couldnt see them removing sexism, racism?etc. Its also mentioned in Give Peace A Chance and Ballad of John and Yoko. I think there was actually a Bag Production that John setup and?Yoko sang in a bag during a gig, no sure if John did. And wasnt it David Frost they got to go in a bag during an interview?? I remember John responding to the allegation that his lyrics to many of his songs (particularly the stranger ones) were inspired by LSD, by saying that for "Being for the Benefit of Mr. Kite" he just saw a circus poster on the street one day, and he was inspired to create an imaginative flight of fancy. I mean, there do exist artists who have that thing called an "imagination" and also "creativity". John was a poet, he had a knack for strange turns of phrase, and he appreciated nonsense and whimsy. I think more often than not, that is the full explanation of any given set of Lennon lyrics (except the ones that are blatantly prosaic and preachy, like "Imagine "). For those who have to "explain" Lennon's poetry, they apparently aren't on the same wavelength and are not "getting" it.